Louisiana Republican Rep. Ralph Abraham gets an ‘A’ for creativity and effort on his proposal to make Louisiana headquarters for the incipient Space Command. Too bad Democrat Gov. John Bel Edwards, whom Abraham challenges this fall, has done what he can to discourage this placement. Last year, President Donald Trump called upon Congress to stand up what ultimately would become a new branch of the armed forces. His preliminary budget request seeks to carve out Space Command first as an agency in the Air Force, then within a couple of years to launch it into independence. To that end, Abraham pitched the idea to Trump that Barksdale Air Force Base become the home of the new command. He pointed out that the facility surrounded by Bossier City already has the Global Strike Command, stood up about a decade ago to coordinate the Air Force’s nuclear capabilities. Space Grant university Louisiana Tech is just down the road, he noted, as well as in the state Louisiana State University also has this designation. He also mentioned the Michoud Assembly Facility in New Orleans which has an extensive history in manufacturing space components. It’s a long shot, to say the least. The state, along with local governments, a decade earlier had a flirtation with trying to attract the U.S. Cyber Command by constructing a high-tech office building surrounded by land for a research park in Bossier City, called the Cyber Innovation Center. Spending over $100 million of taxpayer money to lure the Air Force’s version over from Barksdale, instead it went to San Antonio and the consolidated version now has stood up in Maryland. Since then, the CIC has reinvented itself mainly as an educational tool, and its one tenant brought only a fraction of the jobs that boosters promised. Additionally, the Air Force already has a home for its space activities, at Peterson Air Force Base in Colorado. Located in Colorado Springs, its neighbors include the Air Force Academy and NORAD. That makes it far and away the leader for the home of the new branch. If that wasn’t enough, Louisiana doesn’t have the greatest reputation for having the resources to support such a high tech operation. The Milken Institute placed Louisiana 45th among the states on its 2018 ranking by technology and science (Colorado ranked second). At least the state moved up a spot from the 2016 list, despite its students continuing to score at the bottom of all in English and math. Finally, the state’s overall business climate hasn’t much to commend itself to acquiring a command that could grow to more than 10,000 assigned to duty there. Edwards’ campaign laughably suggested Abraham’s advocacy indicated Louisiana under Edwards had become a “great place” in which to conduct business – despite the governor ramming through hundreds of millions of dollars in increased taxes annually, throwing more money into state government, and creating other disincentives to doing business in the state. As a result, Louisiana continues to wallow near the bottom of overall measures of state business climate. The campaign made note of recent economic development victories in its commentary. But it failed to note recent losses. Just in Baton Rouge, defeats came from IBM’s failure to implement a promised call center, closures of nearby large manufacturing facilities, and Exxon’s pulling back on future expansion in favor of other out-of-state locations. 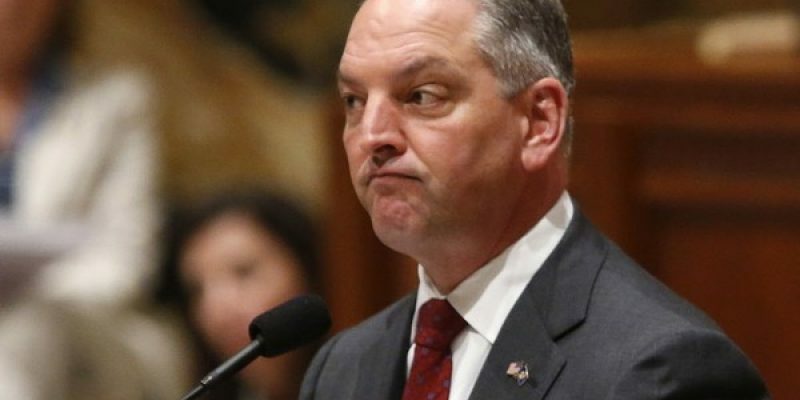 Until the state puts Edwards’ tax-and-spend, redistributionist philosophy behind it, nobody in their right mind would wish to locate in Louisiana a concern along the lines of the Space Command. Give Abraham credit for trying, but give Edwards discredit for doing anything but implementing policies that would attract such an enterprise.